The University of Utah May 2018 Mission engaged USPCAS-W MUET Faculty and Students in a week-long capacity building and collaborative research activities at MUET Water Center. The mission included Dr. Steve Burian, Dr. Tariq Banuri, Dr. Mike Barber, Dr. Mohammad Aslam Chaudhry, Dr. Jennifer Weidhaas, Dr. Rick Beriet, Dr. Tim Edgar, Dr. Jeff Ullman, Dr. Merced Ward and PhD Scholars Mr. Rubayat Jamal and Ms. Quinn Sahulka. The mission emphasis on reinforcing the essential details of the core research activities by conducting two learn-by-doing workshops: (i) Applied Statistics for Research and (ii) Research Proposal Development. On May 03-04, Dr. Tim Edgar, Professor of Geography at University of Utah, conducted a workshop on Applied Statistics for Research for USPCAS-W faculty. The goal of the workshop was to provide training in descriptive and inferential statistics that faculty participants can apply in their research for interpretation and analysis of data, and advise upon while mentoring graduate students. In the workshop, Dr. Edgar introduced some basic statistical tools and explained methodology and process of hypothesis formulation and testing; and discussed calculations of the sampling means included: one-sample hypothesis, two-sample hypothesis, analysis of variance and making it to work. The workshop participants used various sample data to learn the process and also applied these tests to their research data samples. The faculty availed the assistance of Dr. Tim Edgar even after the workshop in applying various methods of applied statistics on their data samples. On May 10-11, Research Proposal Development Workshop was given to USPCAS-W faculty by Dr. Mike Barber and Dr. Jennifer Weidhaas, both Professors of Civil and Environmental Engineering, University of Utah, USA. The goal of Research Development Workshop was to improve the success rate of proposal submissions by the faculty and develop a Feasible, Impactful, Novel, Expert (FINE) research idea. This workshop was in fact continuation of the preliminary part of the training given by Dr. JeffUllmanin April 2018 whereby each faculty developed a research idea and its introductory part as a part of writing effective research grant proposals. During this workshop, Dr. Mike and Dr. Jennifer described two approaches to research development, one was to identify funding opportunity and then develop an idea, and other was to develop ideas first and then search for the funding opportunity. However, the focus of this workshop was to identify funding opportunity first and then develop a best fitting idea. Elaborating it further as to how to respond and proceed for the particular funding opportunity, one example of the recent research proposal call by National Science Foundation, USA on Food Energy Water Nexus was shared and discussed. 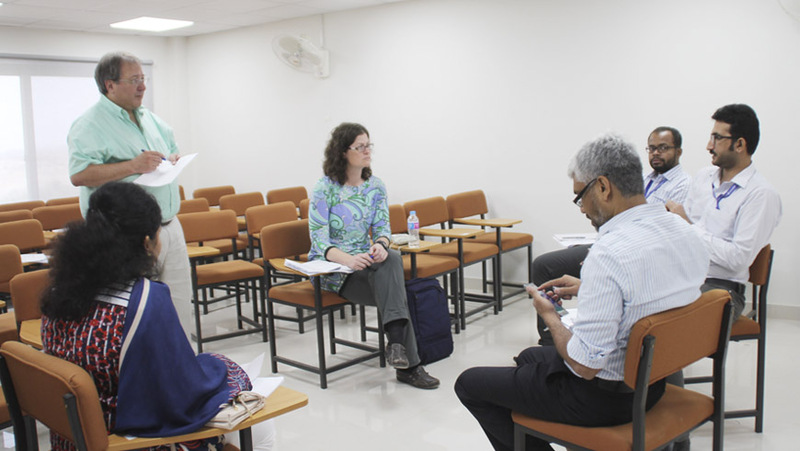 Faculty participants learned how to identify a research question, explore funding opportunities considering Pakistan’s scenario and to write a proposal for the identified proposal call. The focus of this workshop was to train faculty members in submitting an effective proposal and to develop the ideas that fit the best for any funding opportunity. Furthermore, the participants were also introduced to organizational and time management tips and tools for proposal preparation. Some of the faculty participants, including, Dr. Zubair Ahmed, Dr. Naveed Ahmed, Dr. Tanveer Ahmed, Dr. Altaf Siyal, and Dr. Rizwan shared their proposals with Utah team, and were critically reviewed basing on FINE research idea, in order to improve the quality of the shared proposals before submission to any call. In the end of a workshop, some USPCAS-W MUET faculty shared their insight on successful proposals to external funding opportunities. The goal of the Collaborative Research Activities was to advance on-going and pending collaborative research at USPCAS-W MUET. The collaborative efforts were directed towards active research projects and planning of newly funded seed grants of some faculty members. The activities were conducted in four parts: I.Project Implementation, II. Status of Ongoing and Recently Awarded Projects align with UN SDG-6, III. Potential Initiatives, IV. Technical Assistance and Exchange Training Planning. Name of Project: Microbial and Chemical Risks Associated with Water Quality in Hyderabad, Pakistan: Informing Inequalities and Infrastructure Improvements Initially, a meeting was held regarding project implementation requirements and it was decided to collect samples for sample collections from different parts of the city. The participants from University of Utah: Dr. Jennifer Weidhaas, Ms. Quinn Sahulka, and Mr. Rubayat Jamal; from USPCAS-W MUET faculty: Dr. Rasool Bux Mahar, Dr. Zubair Ahmed, Dr. Jamil Ahmed, Dr. Aneela Yasmin, Dr. Ayesha Tajamul, and Dr. Sara Hassan; USPCAS-W MS and PhD Students: Mr. Muhammad Hammad Siddiqui, Ms. Shaista Mubarak, Muhammad Hamma Mr. Ravi Shanker, Mr. Masroor Ahmed, Ms. Uroosa Javed, Ms. Lubna Maheshwari, and Ms. Sundus Saeed;and also the research associates of the project: Mr. Junaid Kori, Mr. Najeeb Channa, Mr. Dilawar Hussain; laboratory technicians: Mr. Mehran Soomro, Ms. Naila , Ms. Sanam Bhatti and others participated in the meeting and went in the field for collection of samples from different locations of the city. Back to the laboratories, the students and the project research associates facilitated by the laboratory technicians analyzed the samples for the mentioned project and for the compilation of the result. In this session, the progress of ongoing projects of the Center was reviewed. The project review meetings were divided as per UN Sustainable Development Goal (SDG-06) and its targets, in which the Principal Investigators (PIs) presented their respective project proposals for refining the project plan with technical assistance of the Utah team – after review of seed grant proposals, possibility of joint publication and review of human resource and procurement needs. Dr. Jamil Ahmed presented his project proposal on “Integrated Water, Sanitation and Hygiene Indicators”. Ms. Rakhshanda Bano presented her proposal on, “Costs for Sustainability of Water Services in Hyderabad”. Dr. Zubair Ahmed presented his proposal on, “Riverbank filtration”, and Dr. Rasool Bux Mahar presented progress on MUET Clean Water Project. Dr. Zubair Ahmed presented his proposal on, “Eco-Innovation in Textile Industry” and Dr. Tanveer Ahmed Gadhi presented his proposal on, “Zero Water Discharge in Textile Processing Industry”. Dr. Abdul Latif Qureshi presented his proposal on, “Canal andCommand AreaMonitoring” and Dr. Arjumand Zaidi presented her proposal on, “Indus River WaterLevel Monitoring”. 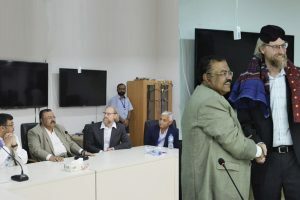 A team including Dr. Arjumand Zaidi, Dr. Asmat Ullah, Dr. Altaf Siyal, and Dr. Ghulam Hussain Dars presented a review on Integrated Development Research – Building on Agency for Barani Areas Development (ABAD). Mr. Ghulam Hussain Dars presented his project proposal on, “Improved Hydro‐Meteorological Forecasting. Another team including Mr. Waqas Ahmed, Ms. Rakhshinda Bano, and Mr. Ghulam Hussain Dars presented project proposal on, “Indus Basin Modeling”. The UU mission delegates participated in the project proposal review meetings, discussed and suggested on technical aspects of the presented proposals including revision of seed grant work plan, and the business plan where applicable. It also helped identify next steps for human resource needs and procurement installation plan. 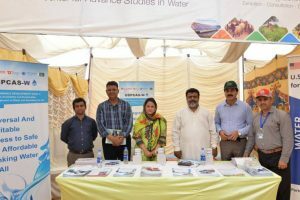 Dr. Bakhshal Lashari, Dr. Rasool Bux Mahar and Ms. Uzma Imran presented, “Irrigation Department Water Quality Management Program”. Dr. M. Munir Babar, Mr. Muhammad Ali, Dr. Abdul Latif Qureshi and Dr. Asmatullah presented the concept note on, “Participatory Irrigation Management”. Dr. Rasool Bux Mahar presented the concept note on, “Microbial and Chemical Risks”. 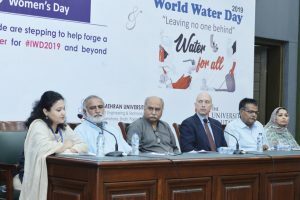 Dr. Aneela Yasmin, Dr. Naveed Ahmed, Dr. Muhammad Rizwan, Dr. Ayesha Tajamul and Ms. Uzma Imran presented, “Constructed Wetlands for Wastewater Treatment”. This mission activity was more focused on planning technical assistance and exchange training to support research at the center. The UU Mission delegates had face to face meeting with selected faculty and students on the summer and fall exchange visits. Also in this session, Mr. Waqas Ahmed and Dr. Steve Burian discussed on the technical assistance for groundwater monitoring. Professor Rick Bereit, University of Utah conducted Thesis Writing Workshop, which was participated by the MS and PhD Students of Batch 2016. The goal of this workshop was to accelerate student thesis writing skills, based on student requests and insight from helping exchange visitors at the University of Utah. Dr. Rick Bereit delivered seminars and exercises to improve accuracy and effectiveness of the students’ technical and professional writing in English targeting improvement in thesis writing. Professor Tim Edgar, University of Utah conducted Applied Statistics Workshop participated by MS/PhD Students of the Center. The goal of this workshop was to provide training in the use of descriptive and inferential statistics that participants can apply in their current and future research. Professor Rick Bereit and Professor Jeff Ullman facilitated Proposal Writing Workshop which was participated by the MS Spring Batch of 2018. The goal of this workshop was to clarify the purpose and contents of writing an effective proposal. At the end, the mission also conducted the individual consultation, advisory, administrative and informational meetings with the MS/PhD Students of the Center of all batches.